In a medium bowl, mix together sugar, flour, and cocoa. 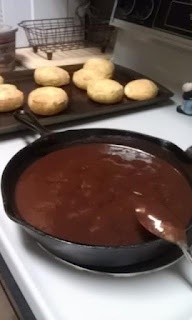 Melt butter in a cast iron skillet (on medium heat) then add your chocolate mix. Stir thoroughly until mixed with butter, then add in milk, stir. You may need to add a bit more milk if it is too thick. While still on medium heat, bring to boil, stirring often. Take off heat & serve over halved biscuits.